It was fairly early in the morning and I was eager to get outside for a hike not worrying much about the harsh midday sun I'd experience. My buddy Kevin and I hopped in the truck and made our way out to Bald Mountain on the north-west side of Mt. Hood. It's a fairly straightforward drive. Turn off Highway 26 in zigzag onto Lolo Pass. Head up for a handful of miles and take the national forest campgrounds and campsites exit on the right-hand side. Once you hit the bridge that leads to the campsites and Ramona Falls trailhead stay left don't cross the bridge. 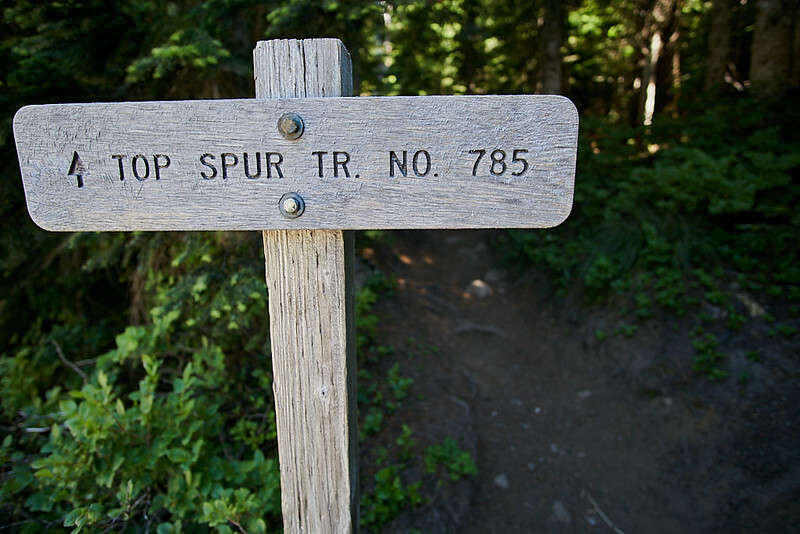 You'll now be on the top spur road, this is an unmaintained forest road that is deteriorating fairly quickly each year. It's paved with large potholes sinks and small washouts. Cars can make it but it is a little risky for the underside and you have to go slow. You will come to a few forks stay to the right on each one and you'll reach the small parking lot at the trailhead. There is some forest trail signs and notes as well as a Porta potty at the start of the trail. As well as a trash can and picnic table. Once you start back on the trail you'll go maybe a 1/8th mile and will see a prominent trail going up to the left between two large trees. This is the old trail to bald mtn. It hasn't been maintained in years so if you can move something off the trail please do. There is a handful of downed trees you must step over and then it gets steep quick. You're now hiking up the side of Bald mtn face, the woods thin out a bit and you can see plenty of newly fallen trees. As of this last week, there are 3 new trees that have blocked a couple sections of the trail making you walk around them instead. Off to your left once it starts to level off you'll see Rainer in the distance, snag a shot if you have a good zoom. You'll walk up to a makeshift campsite with some old concrete blocks that were hauled in years ago from I believe it was the surveyors of the area back in the day. Walk over the small fire pit and through the overgrown brush and behold the splendor of Mt. Hood. She is right in your face and you can see the muddy fork below, as well as the timberline trail far below you. If you go back to the campsite you can walk to the right through the trees and pop out on the steep meadow for some breathtaking views. Take caution as it is very steep and loose dirt. If you fall it won't be a very pleasant tumble. Enjoy your time up there and take in the stellar views. Drink some water and head back the way you came when you were done. Pro tip: bring a trash bag or plastic baggie to pick up debris or litter that you see on your way down. Especially considering this trail sees no maintenance. I recommend doing this hike in the evening time for some amazing colors on the mountain and perfect contrast in the trees. Thanks for reading I'll see you next time!